This is a pretty cool looking rail gun. Electricity replaces gunpowder in a silent, smokeless, machine gun recently perfected for defense against hostile aircraft. Without betraying its location, this weapon is declared capable of firing 150 bullets or high-explosive shells a minute. Projectiles are hurled from its muzzle by a series of electromagnets spaced along the barrel, which start the missile moving and successively raise its velocity as they become energized. Actually, from the description given, it would be a coil gun, not a rail gun. A coil gun uses a series of electromagnets to propel the projectile down the barrel of the weapon. A rail gun uses a different effect called the Lorentz force. The wheel on the side is probably a commutator spun manually or electricly to energize the coils sequentially to accelerate each projectile. Don’t believe the 30’s hype. If the comutator is most likely electrically turned to contact the circuits. And if you use a high power pulse circuit precisely tuned and timed you can bypass any need for capacitors. because the caps are used in the circuits not of nesesity but because the caps have a faster discharge rate than the average battery or conventional power supply. with suficient pulse climb and timing the need for the caps disappears. another option is to switch the caps out just as fast as the coils are being fired for a recharge if caps are even used. slik, modern coil guns are capable of rapid fire, the only limitation being the ability to provide enough power to the capacitors, however newspapers back in the good old days always inflated the numbers for a better sale. 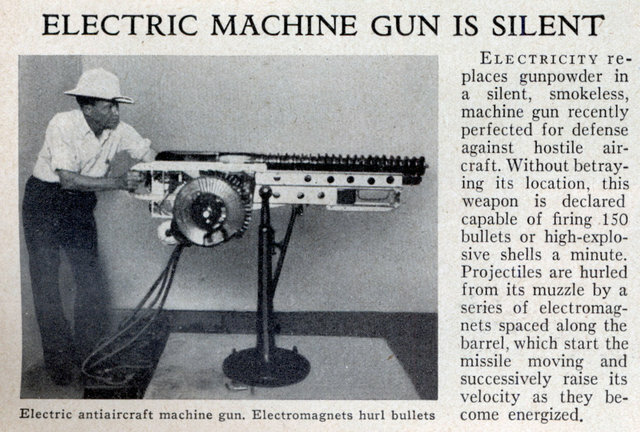 I would say it’s perfectly plausible to have a 150 rpm coil gun given a large enough power source, however the m/ps of the projectile might not be much faster then throwing it by hand. oh my god! its the Gauss rifle from fallout 3! Awsome….with no carbon foot print….perfect!! Made a very much simplified version some 45 years ago when I was a member of JETS. I highly recommend that technically minded youth look to the excellent group for direction. If I’m not mistaken, those are batteries at the guy’s feet. Capacitors capable of holding enough juice to accelerate bullets to a useful velocity are nowhere in evidence, but those cables are impressive. How did this not catch on? Revan343: Rate of fire for one thing (or lack of rate of fire) in comparison to the Browning machine guns of the time. Weight of the power supply and the limits of battery life. Also there’s no mention of muzzle velocity. Well, the one in “Eraser” had near-relativistic speed for its projectiles so assuming this was similar, as an anti-aircraft gun it would be perfect–no need to lead the target at all no matter what the aircraft’s speed. Just point and shoot. Randy: (Buzzer sound) Assuming facts not in evidence! Yeah, a couple car batteries at the guys feet and a barrel a few feet long, that’ll boost it up to near light speed! And of course leaving the barrel that fast air resistance has nothing to do with anything. Nah, the projectile moving that fast through the air will melt it right away, and it will be like a shaped charge (or like Arthur Clarke’s “liquid metal bayonet” weapon in Earthlight). Remember, in space noone can tell how far in your cheek your tongue is. You are right, of course, Firebrand38, my ravings aside… Muzzle velocity and projectile mass are the two most important characteristics of a firearm (since it is basically a kinetic energy weapon) and neither are mentioned. 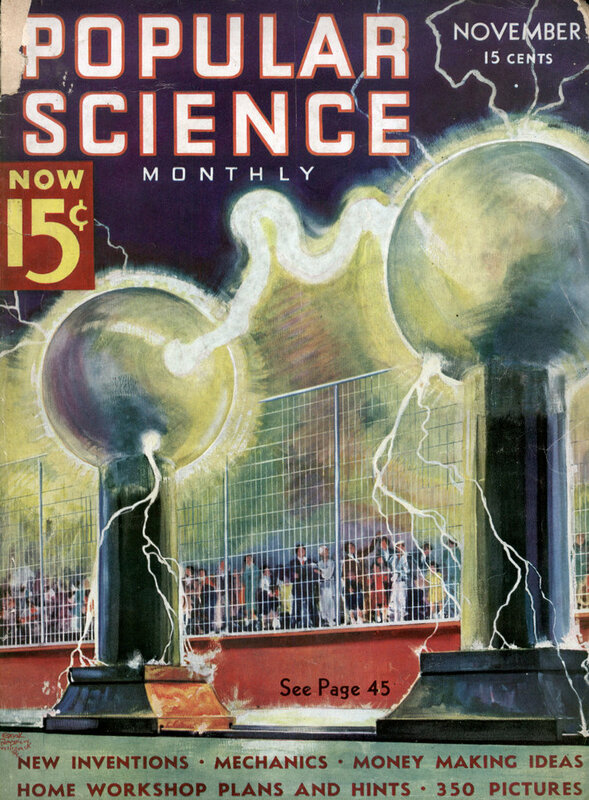 On the other hand Edwin F. Northrup was doing experiments on electromagnetic propulsion for space launches in the 1930’s and apparently built several prototype launchers, but I haven’t been able to find any substantial information about them. Randy: Top marks on finding that patent! I checked out Northrup as well but none of his designs seemed to match this. No, Firebrand38, top marks to YOU for finding the “Zero to Eighty” excerpts that I failed to locate. A high rate of fire can be achieved readily if John Azibl’s claim that the weapon would work with car battery voltage is true. If you look at a simple (pre-ECU) points-type breakerless vehicle ignition the system can deliver rapid distribution of discharges to 8 or even more locations reliably at rates of 1000 per minute and sometimes greater. My 1975 Volvo has a 4 cylinder pushrod motor (modified B20E for all you gearheads out there) which redlines at 7000RPM. If we assume each cylinder fires once per engine revolution, 7000/4 = 1750 sparks per minute at each plug. I suspect the voltage discharged by the coil (which is essentially a very large, fast-charging capacitor) is significantly greater than 12V but I am not certain, I do know it is at least that. It is worth noting that on engines with a higher cylinder count (i.e. a straight six or 8-cyl, or even a 12-cyliner engine) the practical limits on engine RPM are essentially the same but the number of discharge points (spark plugs) in the system is greater so you are dividing ~7000RPM by a greater number of spark plugs which results in a lower rate of discharge at each plug. However, a well-designed electrically operated “ignition” or similar system might not experience the same limits on top speed (these are more mechanical and having to do with the high heat / friction within other parts of the engine) so a very fast rate is probably sustainable in something made to power one of these coil guns. I don’t see any reason why this sort of design couldn’t be translated to powering the coils in a MAC/Coil gun rapidly and in sequence, it works fine in millions of vehicles every day and has for a very long time. I would like to add that the vehicle ignition-style charge delivery system I am thinking of would probably require many larger capacitors to power anything that fired very large projectiles. The weapon depicted in the image above might actually be operable with something very similar to a vehicle ignition system, but anything firing high-mass projectiles or requiring larger diameters would need a more powerful charging system for the coils. It didn’t catch on ’cause they couldn’t find a long enough extension cord. you’re right that the projectile will melt/vaporize long before reaching light speed in atmosphere, thanks to atmospheric friction, but it’ll be nothing like a shaped charge. A shaped charge when fired turns a shallow cone/dish of metal into a cohesive hyperplastic jet of molten metal. It loses effectiveness (breaks up into smaller globs of metal) after a couple meters; hence the need for contact fuzes. I couldn’t help but to throw this one out there. Am I the only one who notices that the coil on the side is a P.M.G.? The batteries are simply to rotate the P.M.G. producing the power needed.